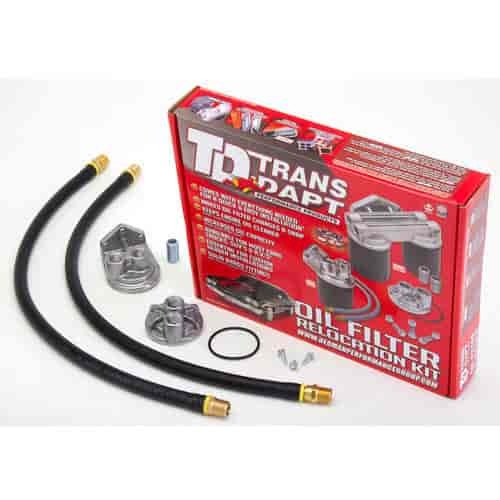 Trans Dapt Remote Oil Filter Relocation Kits increase oil capacity and allow you to relocate your filter to a location that makes oil changes quicker and easier. Kits include an oil filter bypass adapter, remote oil filter bracket with 0.50" NPT inlets and outlets, two 30" hoses with fittings, mounting hardware and instructions. Each cast aluminum bracket accepts 3/4"-16 spin on oil filters, is CNC-machined to exact tolerances and heat treated to deliver maximum strength and durability. These kits are not for use on diesel engine or marine applications. The Single Oil Filter Relocation Kits are Trans Dapts original design and the first of its kind on the market. They are considered the premier oil filter relocation kit and include everything except the filters. The Dual Oil Filter Relocation Kits are designed to double the filtering capabilities and add an extra quart of oil. Dual filtering reduces oil temperatures while providing maximum engine protection. Filters not included. Note: For Use with 969-1156, Fram PH8A or equivalent oil filters (sold separately). Does Trans Dapt 1120 fit your vehicle? 1120 - Trans Dapt Remote Oil Filter Relocation Kits is rated 3.0 out of 5 by 1. Rated 3 out of 5 by oldvartom from good kit but supplied hoses too short for most app Got the kit and installed adapter and hoses to remote filter. Hooked up ok. I suggest a small amount of oil to fit hoses to barbed fittings. This kit needs 90 degree fittings on engine adapter or hoses will crimp when trying to mount remote filter . The supplied hoses need to be at least 36". Installed on a Pontiac 389 to allow filter clearance to "A" arm for control arm. Still looking for a place to mount with such hoses. Need to clear exhaust n no place on firewall wth short horses.